Click to view/print Loan PDF. 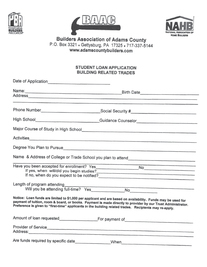 ​The Builder’s Association of Adams County is very proud to be able to offer assistance to students who have attended Adams County high schools and are furthering their education in the building related trades. Special consideration for loans will be given to BAAC member’s children who are pursuing degrees in other areas. This will be secondary to those students applying for loans to pursue building related trades, at the discretion of the Board of Directors and based on fund availability. The program is made possible by funding from our annual Adams County Home Show and is set up as an interest free, deferred student loan, providing the recipient abides by the trust agreement. The trust agreement allows repayment to begin three months following either termination or completion of the post secondary education. You are given a twenty-four month repayment period with the monthly payment calculated by dividing the total amount of the loan by the twenty-four months. Each application is reviewed on an individual basis and funding is granted based on availability. One loan is usually allowed per year, but we will also consider additional funding for the second semester if our funds are plentiful. Recipient repayments may also be extended if the monthly amount is taxing to the student and is evaluated and approved by individual request. Loan funds may be used for tuition, books, room and board, etc. Applications must be submitted along with letters of reference and grades. Each application is reviewed by the Board of Directors at the monthly board meeting. Each recipient and a guarantor (parent) must sign a trust agreement, which is administered by ACNB Bank’s Trust Department. If a student returns to Adams County and goes to work for a member of the BAAC for a minimum of one year of satisfactory employment, we offer a reduction of $500 on their loan.